Portugal is becoming more and more prominent in the world tourist panorama and the Portuguese beaches, much praised by those who visit them, are one of several reasons that bring thousands of tourists to the Country. Now the European Best Destinations website, which has already awarded Porto and Lisbon in several categories, chose a Portuguese beach as the best in Europe: the Galapinhos Beach in Setúbal. 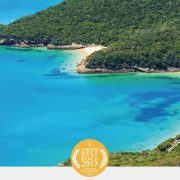 With a breathtaking view, located in the Arrábida Natural Park, the luxury travel site describes it as “the perfect beach in a natural environment not deteriorated.” Galapinhos beach is at the top of the site users’ preferences, in front of Canal d’Amour (Greece), Porto Timoni Beach (Greece), Santa Giulia Beach (Corsica), Moscenicka Draga Beach (Croatia), Beach of Pregonda (In Menorca, Spain), of Monterroso al Mare (Italy), among others distinguished by the ‘European Best Destinations’. The site does not fail to recommend a visit to Lisbon, Porto or Sintra, but adds that it is worth spending some time in Setubal and, why not, staying in Troia.